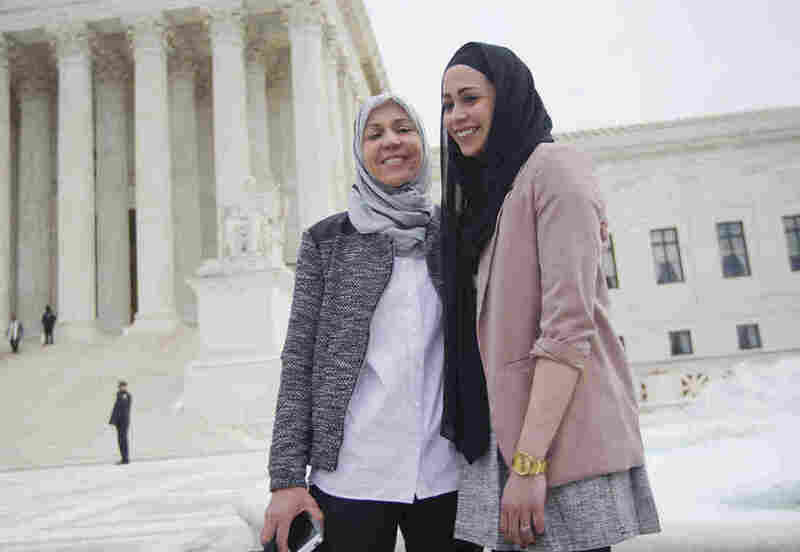 Supreme Court Rules For Woman Denied Abercrombie & Fitch Job Over Headscarf : The Two-Way Samantha Elauf had applied for the sales job in Tulsa, Okla., and was recommended for hire by an interviewer. But Abercrombie has a "look policy" that bars the wearing of caps by its salespeople. Samantha Elauf (right) stands with her mother, Majda, in February outside the Supreme Court in Washington, D.C. The Supreme Court has ruled 8-1 in favor of a young Muslim woman who was denied a job at Abercrombie & Fitch because she wore a headscarf. Samantha Elauf had applied for the sales job in Tulsa, Okla., in 2008 and was recommended for hire by an interviewer. But Abercrombie has a "look policy" that bars the wearing of caps by its salespeople. The Equal Employment Opportunity Commission took up the case, and the U.S. District Court ruled in favor of Elauf, awarding her $20,000 in damages. The 10th U.S. Circuit Court of Appeals reversed the decision, concluding that an employer cannot be held liable under Title VII of the Civil Rights Act for failing to accommodate a religious practice until the applicant provides the employer with actual knowledge of his need for an accommodation. "Abercrombie maintains that if Elauf wanted a religious exception allowing her to wear her headscarf, it was up to her to make the case at the time of her interview. Elauf responds that she didn't even know about the look policy, and that deliberately downgrading an otherwise highly rated applicant because of a religious practice violates the federal law banning religious discrimination in employment." "Religious practice is one of the protected characteristics that cannot be accorded disparate treatment and must be accommodated." "The court majority held that to win a claim of disparate treatment, job seekers just need to show that their need for accommodation was a motivating factor for an employer, not that the employer actually knew for certain the prospective employee would need an accommodation." The dissenting vote was Justice Clarence Thomas. "We have made significant enhancements to our store associate policies, including the replacement of the 'look policy' with a new dress code that allows associates to be more individualistic; changed our hiring practices to not consider attractiveness; and changed store associates' titles from 'Model' to 'Brand Representative' to align with their new customer focus." However, the company says the Supreme Court "did not determine that A&F discriminated against Ms. Elauf" and that the company will "determine our next steps in the litigation." "The court's decision sends a powerful reminder that religious discrimination has no place in the workplace. Employers should welcome and accommodate religious diversity, not shut their doors to it." The Council on American-Islamic Relations, CAIR, which had filed a friend-of-the-court brief in the case, also welcomed what Executive Director Nihad Awad called a "historic ruling in defense of religious freedom at a time when the American Muslim community is facing increased levels of Islamophobia."